I'm so pl﻿eased to share with you another look at new designs for the spring summer 2011 Love Lune Collection. 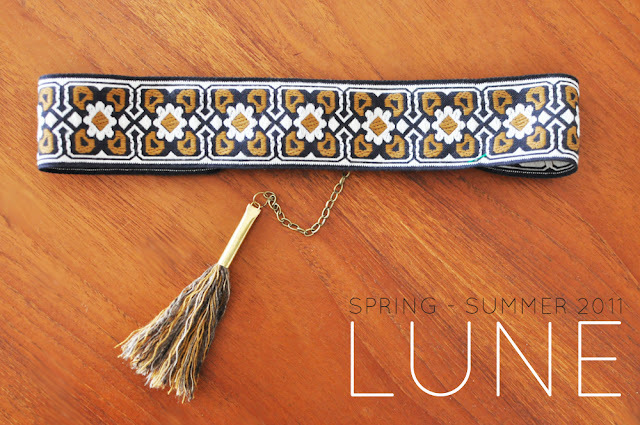 We're hard at work over here getting things all set up for spring, including creating an online shop for the Love Lune collection which will be open March 15! 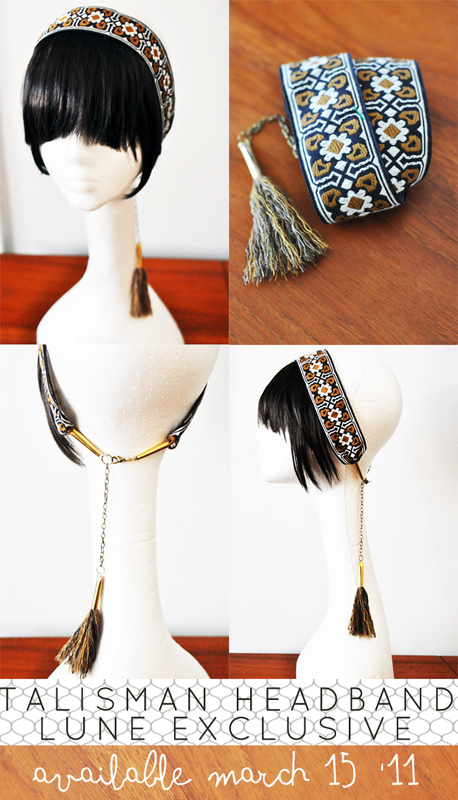 The Talisman Headband is an extension of the Tassel Talisman line. This particular pattern is a local/online shop exclusive because it's band is created from a spool of gorgeous embroidered vintage trim. Working with vintage materials is my absolute favorite, but this also means the production is limited so we will be offering this particular pattern as a shop opening exclusive on March 15, 2011! The Talisman Headband will also be available in velvet solids for those of us who like to keep it minimal. All headbands feature a matching tassel, and adjustable chain at the base of the neck so you can wear it across the forehead hippie style, or at the crown of your head. All Love Lune collection accessories come packaged in a custom corn colored linen pouch for safe keeping. I hope you enjoy what we're creating for this coming season. I always feel so energized when designing for Love Lune, and it feels so good to finally pull it all together. I believe in this collection because every single piece is something I would love and be proud to wear myself. I think, as a designer that's the most important reason to create - the drive to make things you truly feel are beautiful. Secondly, it's nice if others think it's special too.